You are currently browsing the archives for the tag 'anna dello russo for h&M'. I would like to dedicate the first day of 2013 to a flashback of 2012. It was such an exciting year for me and I am truly thankful for all the magic moments I was able to experience and share with you. 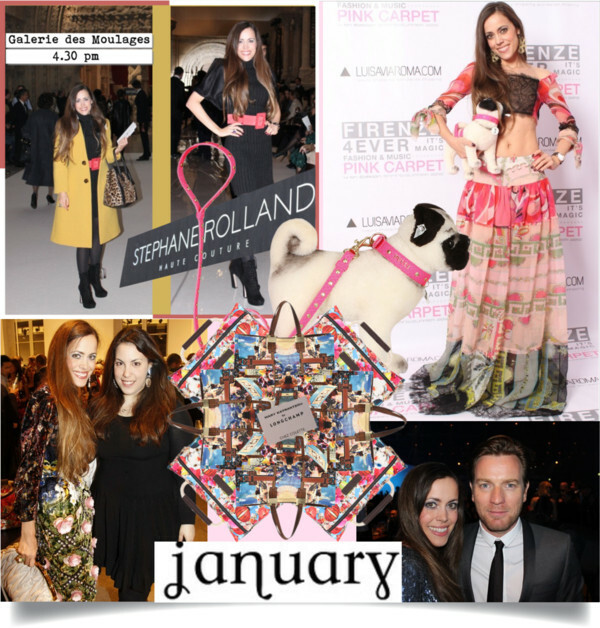 May 2013 bring us as many adventures and fashionable events as 2012 did. The year started with my visit to the fourth edition of Luisa Via Roma’s Firenze 4 Ever. As usual I had a lot fun, for example having dinner at the church, and adopted the Emilio Pucci Pug Dog for Happy Kids. It had been my third time at Firenze 4 Ever. Then, I went to Paris for the Haute Couture shows and celebrated with Mary Katrantzou the launch of her amazing collaboration with Longchamp at Colette. Another highlight of 2012’s first month was the IWC Top Gun Gala held during the SIHH where I met lots of celebrities. 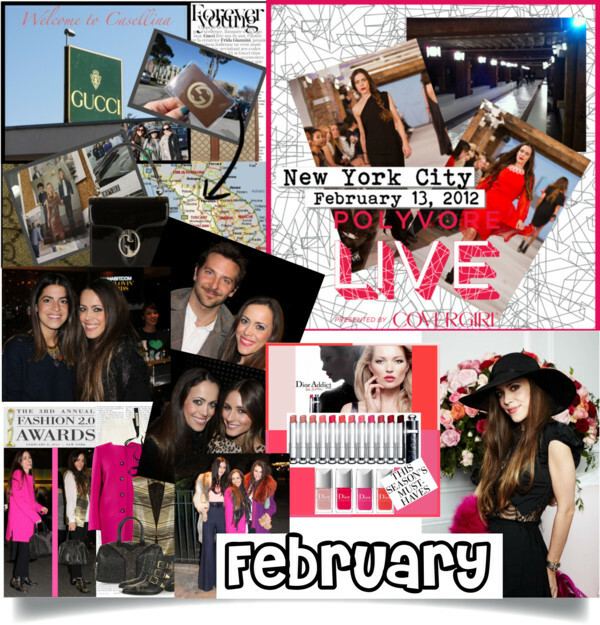 In February, I flew to the Fashion Week New York where I walked in my first runway show, Polyvore Live. I went to many fashion shows, spotted celebrities such as Olivia Palermo, Bradley Cooper and attended the Fashion 2.0 Awards plus the Bloglovin’ Awards. After coming back from NYC, I had around 24 hours to repack and left for Paris with Dior for my photo shoot for the launch of Dior Addict Extrême. Later this month, I accepted Gucci‘s invitation to see the F/W 2012 show, followed by a trip to Florence to visit the manufacture. March started with Paris Fashion Week. Spotted on the streets, bloggers and editors wearing the veiled beanie designed by Stephen Jones for Jil Sander. The sun was shining already and I wore my first summery outfits like this one by Emilio Pucci. In the end of the month, I flew to London to meet the American designer duo Kaufmanfranco at the net-à-porter offices along with jewelry designer Diane Kordas. 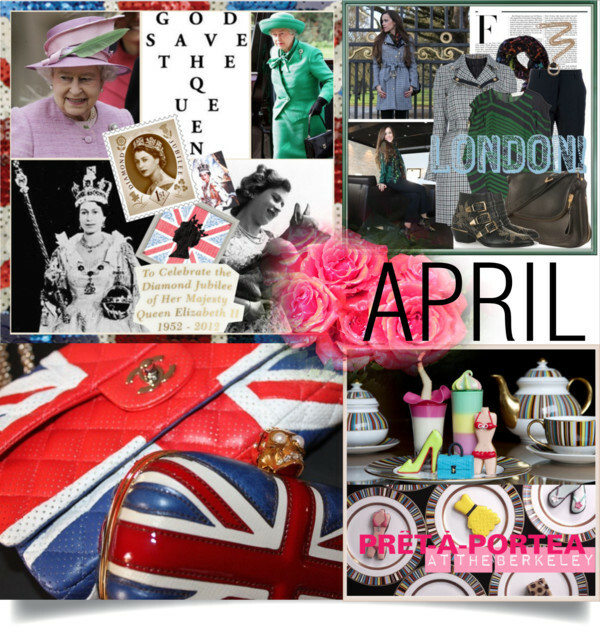 April marked the Diamond Jubilee of Her Majesty Queen Elizabeth II. A good reason to fly again to London. As it was Easter break, I took my daughter on a girls’ trip. In my luggage, of course, all of my Union Jack-inspired must-haves. A lot fun for every fashionista: Having Prêt-à-PorTea at the Berkeley. 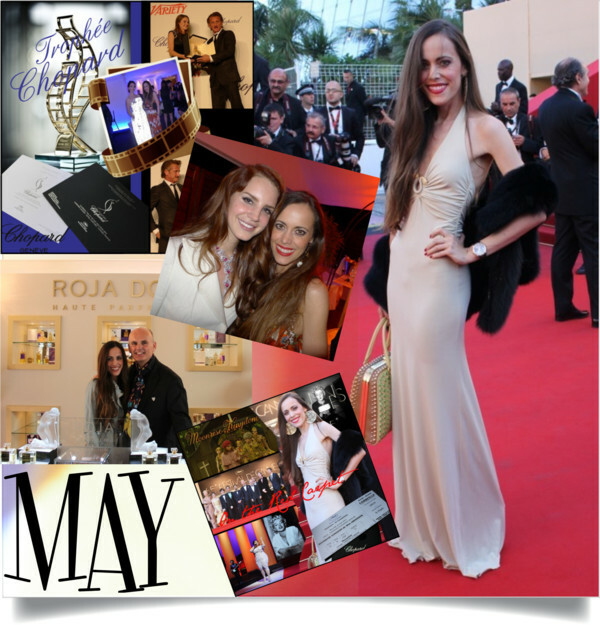 Being on the red carpet at the Cannes Film Festival was truly one of the biggest highlights of the year. The night of the Chopard Trophée was outstanding. The most memorable part: A private performance of Lana Del Rey. A wonderful trip to the Lausanne Palace & Spa finished off this amazing month perfectly. I indulged in the world of Roja Dove’s Haute Parfumerie and enjoyed a feast for senses at La Table d’Edgar. June was a busy month. I started for one day in Paris for the launch of Pleats Please by Issey Miyake. Then, the Art Basel took place. My favorites: Montblanc‘s party to celebrate the 10th anniversary of their Cutting Edge Art Collection together with Parisian art gallery Perrotin and Galerie Gmurzynska’s private dinner held with Zaha Hadid for the start of the Art Basel. Later in June, I went on my road trip through the US with stops in Chicago, Denver and Salt Lake City. I drove all the way through Wyoming to Mount Rushmore, South Dakota, survived a hail storm and visited the Bonneville Salt Flats, Utah. 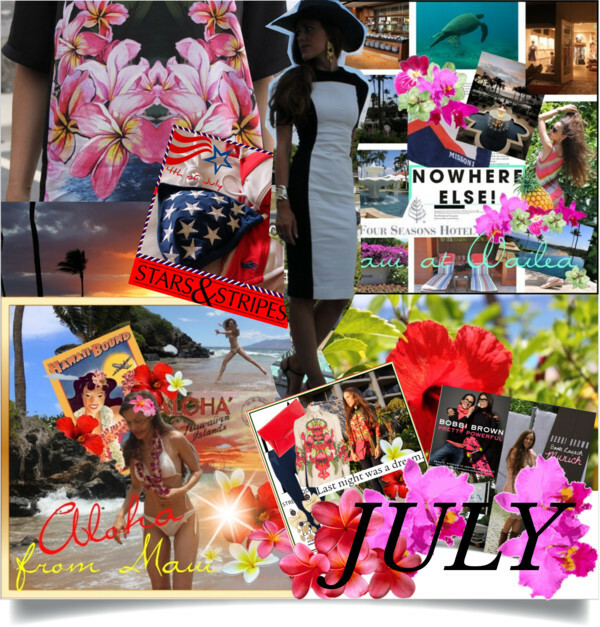 July was such a relaxing month that I spent mostly in Maui, Hawaii followed by a short trip to Texas before heading home to Switzerland. Just a few days later, I flew to Munich for the launch of Bobbi Brown’s newest book Pretty Powerful. In August, I flew quite a lot to Germany for work and Sandra’s Closet reached 40.000 Facebook likes (By the way, today we are close to 75.000 likes, how amazing is this in this short amount of time?!). An absolute highlight were the St. Moritz Art Masters where I had the honour to be photographed by Amedeo M. Turello and Steve McCurry, two of the most famous photographers in the world. The results will be posted soon. 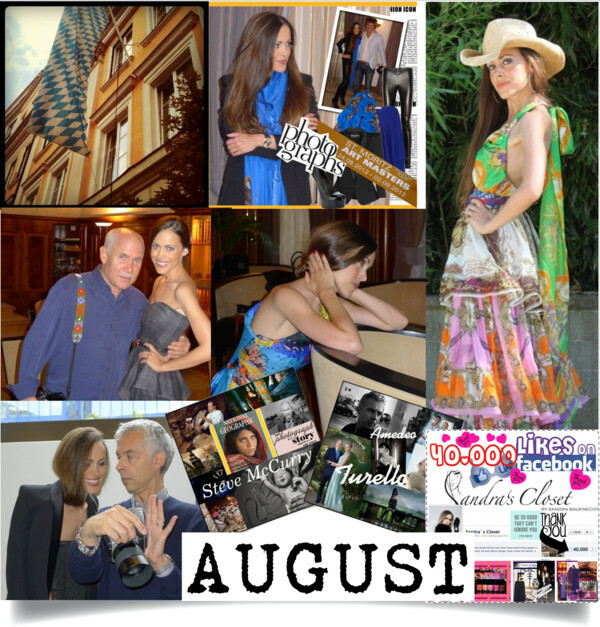 September was one of the busiest months of the year. For me, it started with the Venice Film Festival. I was invited by Gucci for the launch of Gucci Première and was so excited to meet with the face of the campaign, Blake Lively. Right after, I had the photo shoot for Swiss News. In Zurich, I met perfumer Geza Schön during a lunch over the rooftops of the Swiss city. With Dior, I attended the Zurich Film Festival. With Piaget, I went to the Biennale des Antiquaires in Paris and visited the famous Château de Malmaison. Just a few days later, I flew back to the French capital for Fashion Week. Best party: Anna Dello Russo’s Paradise Ball. Favourite shows: Pascal Millet and Jean Paul Gaultier. The first days of the month, I was still in Paris for Fashion Week and attended blockbuster shows such as Chanel, Louis Vuitton, Valentino and Miu Miu. Later, I flew to Hamburg to visit the Montblanc headquarters and worked on the creation of my Bespoke Limited Edition Ink “Sandra Berry” that was launched in the end of the year. Another exciting collaboration with Closed was revealed: My limited edition blogger “Zurich” T-shirt. Then, I left for New York City for the best party of the year: The launch of Maison Martin Margiela with H&M where I spotted celebrities such as Julianne Moore, Chase Crawford and Sarah Jessica Parker. The last days of the month, I went to Geneva to visit the Chopard headquarters in Meyrin. Another busy month that started with the Mercedes-Benz Fashion Days Zurich. November marked a lot of events on Zurich‘s social agenda, such as the opening of the Rolex boutique and the Moncler store. I flew to Greece with Hermès and hosted the exclusive Caviar & Oyster collection dinner with Bobbi Brown at my house. Such an exciting month for me as my Montblanc Bespoke Limited Edition Ink “Sandra Berry” has been finally launched. I went to Gstaad with Louis Vuitton for the opening of their new store in the Swiss Alps and flew to Doha, Qatar for New Year’s Eve. If there is one thing I hate, it is packing. And for Fashion Week, it is even worse. 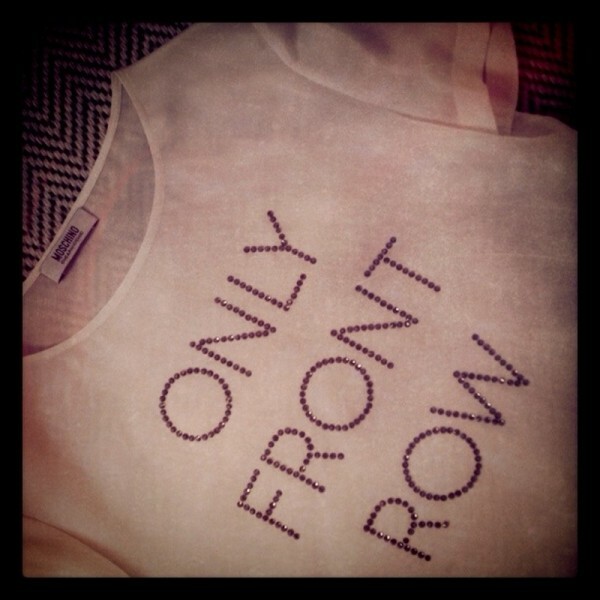 But with my new diamanté-embellished silk top by Moschino Cheap and Chic the message is pretty clear “only front row” please! Tomorrow, I will be leaving for Paris. In the evening, I am invited to a real fashion shower: Anna dello Russo’s paradise ball to celebrate her collaboration with H&M that will be launching on October 4, 2012. Totally excited! Stay tuned for many photos to be posted!